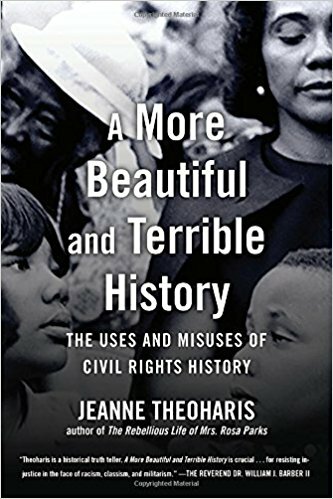 In Jeanne Theoharis’s important book, A More Beautiful and Terrible History: The Uses and Misuses of Civil Rights History, makes the point that we often look back to events like the 1963 march on Washington and think that the majority of the country supported such events. The reality is much different. In fact, the federal government was monitoring the organizing leading up to the march and the event that day on August 28, 1963. The federal government was so concerned about what might be said, that they had it set up that they could cut the sound system when necessary, to make sure people were not calling for an uprising that day. Another mechanism that the state used that day was to have over a thousands police officers attempting to manage the march in the nation’s capitol. Lastly, the major news outlets around the country reported on the march with some suspicion, specifically how the march was too polarizing and that it did not reflect what most Americans wanted. This sentiment was true, based on polls taken during the 1960s. According to Theoharis, a Gallup Poll taken in 1961, showed that only 22 of Americans polled supported the Freedom Rides. In 1968, another poll that was taken by Gallop, shortly after Dr. King was assassinated, showed that 73% of whites said that blacks in their community were treated the same as whites. 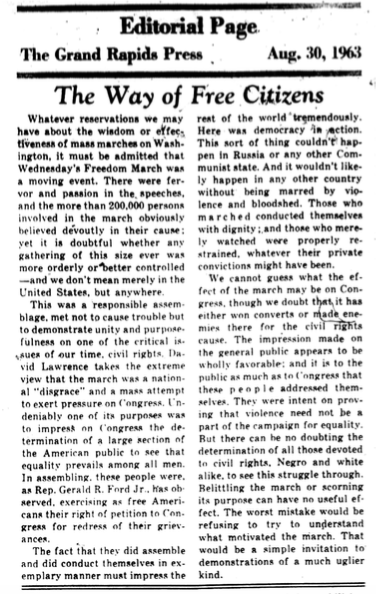 As an example, our post today, takes a look at how the Grand Rapids Press editorialized about the 1963 March on Washington. Besides the Grand Rapids Press editorial on the 1963 march on Washington, we include three opinion pieces from non-Grand Rapids sources. We include these piece, because this is what people were reading in the Grand Rapids Press in the editorial section, which also influences how people understand what took place in the summer of 1963 – which are linked here. The Grand Rapids Press editorial uses supportive language and taken out of context might seem like those who wrote this editorial were endorsing the 1963 march on Washington. However, up closer review, within historic context, we can see that this editorial is really framed through the lens of White Paternalism. The Press editorial staff practices White Paternalism by saying, “more orderly and better controlled.” This signals that has there been any civil resistance, the marchers would have lost all credibility, in the eyes of the GR Press editorial staff. The fact is, that the Southern Christian Leadership Conference and other black groups involved wanted to have civil disobedience as part of the march, but they were pressured by the Kennedy administration, the AFL-CIO and the Catholic Church not to engage in that kind of action. The Press editorial writer then goes on to say that “this was a responsible assembly,” and then he compares it to the negative response from David Lawrence’s commentary, which the Press published alongside their editorial. (see link above). Apparently the restraint exhibited in the marchers was also a demonstration to the world that these kinds of actions need not be violent, which would surely have been the case if this took place in Russia, at least according to the GR Press editorial. The rest of the editorial again valorizes the fact that there was no violence expressed on the part of the marchers. Nothing is included in the editorial about what it was that those who spoke or the march organizers were demanding from the federal government. In fact, the only person identified by name in the editorial, was Congressman Gerald Ford. Black voices were not centered in this editorial, indeed they were completely absent and seemingly irrelevant. Ironically, there was violence at the 1963 march on Washington. The violence was demonstrated on the part of the state, by rigging the microphone to cut off if what was said was not found acceptable. There was the threat of violence with the presence of over 1,000 cops ready to arrest people if they were not “orderly.” Then there was the violence of state surveillance, since we know that the communications between organizers was being monitored and their hotel rooms were being bugged by the FBI. In fact, there were an estimated 150 FBI agents there, just to monitor the crowd, according to Gary Younge’s book, The Speech. Then there was the systemic violence, which is why thousands came to DC to express their grievances. The segregation, the white supremacy and the brutality of police violence that black people experience, as Dr. King pointed out in his speech at the march on Washington. King also made it clear that the federal government failed to make good on its promissory note to blacks to be granted equal rights. King makes it clear that the violence of poverty, poor housing and lack of jobs for black people was the violence that the system imposed on black people. Our next post will look at the reporting from the Grand Rapids Press on the 1963 march on Washington. This entry was posted in Civil Rights/Freedom Movement and tagged GR Press and the 1963 march on Washington, GR Press editorial, white paternalism. Bookmark the permalink.